Brief Synopsis – Following the death of the patriarch of the family, his heirs travel around Europe and the Middle East together where one of them is mysteriously murdered, making everyone a suspect. Detective Hercule Poirot is the only one around who can try to solve the crime. My Take on it – This is a film that I was curious to see especially after the fact that I really enjoyed the recent remake of Murder on the Orient Express (2017). 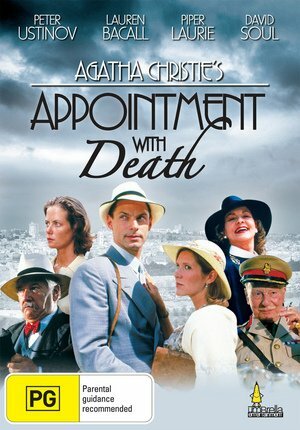 Agatha Christie is a great mystery writer and I love the way that they are always able to take a large group of suspects and make it conceivable in some way that each of them could be the culprit because it add s much more fun to the mystery since things are never clear cut. The plot gets nice and convoluted and s filled with lots of twists and turns that help make us guess again and again as to who the true murderer might be since until the end, there are so many possible suspects who seem to have a good motive of murder. Peter Ustinov is great in the lead role of Hercule Poirot and is so much fun to watch as he tries to solve this crime despite the fact that things are constantly in motion which turns the tables on all of the suspects. The change of the location of the events was a nice surprise to me since I am personally much more familiar with the locations in Jerusalem and the Dead Sea that are depicted here than of Petra and the surrounding areas. The cast is superb and the fact that they give us so many famous and familiar actors in the film helps make the mystery more compelling because it leave so many possibilities as to who might be the actual murderer. Can’t wait to see even more Poirot mysteries. Bottom Line – Another great Agatha Christie murder mystery that takes a large group of suspects and is able to have Poirot winnow them down the the most likely suspects and the inevitable culprit. The twists and turns in the story work quite well especially when they give so many of the characters conceivable motives yet there is constantly something new that pops up that switches things on us. The change of the location from Jordan to the Dead Sea was great for me since I am quite familiar with many of the areas and locations depicted which helped make the story feel even more personal to me. Great cast also helps keep things trilling because you never really know who is the most likely suspect. Ustinov, as always is superb in the role of Poirot. Recommended!